So, here it is, Saturday, my 3rd week back home…and finally I am off for the field. I haven’t minded, as it has been rainy and cold constantly, but today looks beautiful. It is a 5 hour drive, and we are caravanning up. Part of the crew is already there, a bunch of students have gone to set up camp and open the sites we will work. Preliminary reports are a little disappointing….I always hope for that fantastic, complete, articulated dinosaur revealing itself with the first shovelful of dirt, but alas, that hardly ever happens…. We head off in a chain. Because I have a bit of a lead foot problem—just a little—it is agreed that I will lead. So, I tune to my favorite country radio station, and I am off! East on the interstate to Big Timber, where we stop for a gas tank top off, and to let everyone catch up. The snow covered Crazy Mountains rise up above the valley floor, oh they are beautiful. We will follow them all the way to Lewistown and beyond. They are spectacular! Then, it is north on a two lane state highway to Lewistown, the geographic center of the state. Historically an old cow town, but also a railroad hub that serviced the whole state in the early days. I love this little place. It is a last hold out of the old Montana. Cowboys and hard working basic folks, in touch with the rhythm of the land and the seasons….the buildings are awesome,reflecting the importance of this place, once. Then, it is north again, past the now familiar sounding names of the scattered ranch and cow towns. Judith gap, with the awesome windmill farm I talk of each year. You would think that all these windmills would ruin the scenery, but I love to watch their giant blades, turning slowly in all directions at the whim of the wind. I have heard that each windmill cost about $4 million to build, and there are at least a hundred of them, oriented in all directions so that some are always moving while others are still. If you are going to make money from the wind, this is definitely the place to do it. Then, we pass small towns that I haven’t noticed before, with highway signs pointing the way to Buffalo, and Straw, and Grass Range. The ranching heritage is strong here, as is the connection to the land and the past. 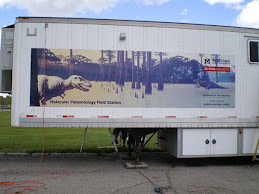 Somehow, it is appropriate to be studying dinosaurs here. Finally, we pull into camp. It is amazingly plush compared to most of the sites we have settled before. This land where we will base our operations is owned by a North Carolinian who is interested in furthering education and opportunity there. He owns a lot of Montana ranch land, and has been so generous in his support of this effort of ours, to expand opportunities in Paleontology to NCSU students. There is electricity—sorta a must for running our lab stuff, and the local managers of the property—Gary and Barb Anderson—are awesome. They have dug and placed an outhouse for us—trust me, this is sure better than having to dig one ourselves—and mowed the grass near where we can pitch tents to keep the snakes away. MUCH appreciated. We can walk across the property to the river, and can swim away the grime of a day removing overburden in the hot sun….I decided to pitch my tent on a bank overlooking the river, far away from the rest of the crew. I am old, and my privacy and sleep are pretty important at the end of the day…. I have a new tent, sleeping bag and cot. Oh, the comfort! I can stand up in there! No more laying down to pull on jeans, and I am sleeping off the ground. It is plush indeed! So, the first night I crawled in, looking so forward to a restful sleep…only to be kept awake for hours listening to this pesky hoot owl, arguing with a pack of coyotes just across the field. It was ‘Hoo-to wooo Hoot’ and ‘Yip yip yip yowwwwwww weee’ back and forth for hours. I don’t know which one finally gave up on the argument first, but finally it was quiet enough to sleep….and oh, what a great good morning! The sun is shining and it will be hot. I feel so incredibly lucky to be here, to have the job I have, and all the opportunities, to leave the city behind and touch my roots, and all that I love so much about this land of my ancestors.